The big news of the weekend was Julio Urias' live batting practice session on Sunday, and by all accounts he was very impressive. In the photo above, Alexander Guerrero waits by the batting cage in preparation for facing the Mexican phenom. He would eventually strike out on three pitches. Photo via Jesse Sanchez on twitter. Awesome! Tom Shieber at Baseball Researcher determines that an 1886 Base Ball board game features old Washington Park - a past home of the Brooklyn Dodgers: "There Used to Be a Ballpark Right Here - Washington Park." Based upon my own research of that fabled ballfield, I think Tom is right. Via Eric Stephen at True Blue LA, "Julio Urias impresses in first test against live hitters." "They are experienced hitters, and I'm still learning," Urias said. "It is special, and I still feel like I have some work to do." Via JP Hoornstra at the Daily News, "Dodgers’ Kiké Hernandez is a man of many positions." Via Jesse Sanchez at MLB.com, "Guerrero believes he can help contribute to Dodgers now." "The team does not know what they are going to do, but all I can control is keep working hard and they will get the final word," Guerrero said. "I don't want to go down. I'm not going down. I feel like I can get better here at this level and play every day. I think that's what every player wants. You want to be in the Major Leagues and play as much as you can. All of the recent stories about how Guerrero could be a "problem" are overblown. His comment about "not going down" sounds to me like that he is resolute in his quest for a job with the Dodgers and he is confident in his abilities. Via Lou Musto at the Gammons Daily, "Joc Pederson is baseball’s must-watch prospect in 2015." 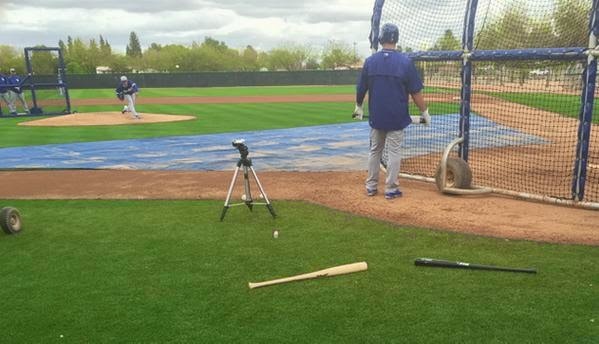 JP Hoornstra shared a video on twitter of Urias' session against Joc Pederson. Watch it below.